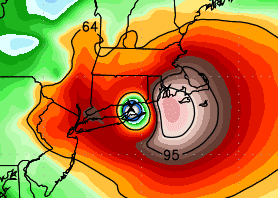 In order to assess the threat from Irene, we need to look at some wind distribution forecasts from NOAA computer models. Even if this is not a perfect forecast, we see two things. Very strong winds (brownish and white areas) and they are very wide. So, even if the storm shifts a little to the east or west, there will still be strong enough winds (from dark red to white to dark red) to cause power failures and tree damage if this forecast is approximately correct. The area with damaging winds in this forecast is eastern NC, SE VA, Delmarva, and along and east of I-95 from about Baltimore to NYC to Boston. 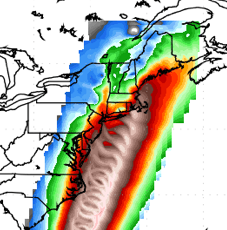 Now, this is a higher resolution forecast. The center of Irene is at the X. This is at a single point in time so we can see the details. Note that if this is a perfect forecast (it may not be), there are winds of more than 100 mph, at least in gusts, to the east of the center moving into southeast Massachusetts. Note that winds of 60 mph extend all the way west to NYC. My point in showing this is not to try to figure out what the wind might be at a given location but to give you a guide as to what the winds might be if the system shifts to the east or west. 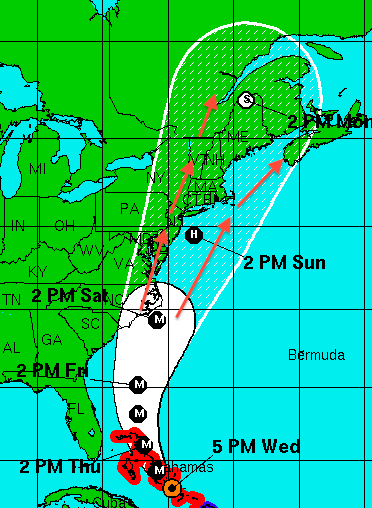 Now, here is the National Hurricane Center's 5pm path forecast. The outer stippled area is the average statistical error at 72-96-120 hours (which means it gets wider with time because longer-term forecasts are less accurate than shorter term forecasts). I have added arrows based on the latest forecast to show the geographic corridor I expect the center of Irene to pass down. Not only is the wind a threat, the ground around NYC and surrounding areas is already moisture. 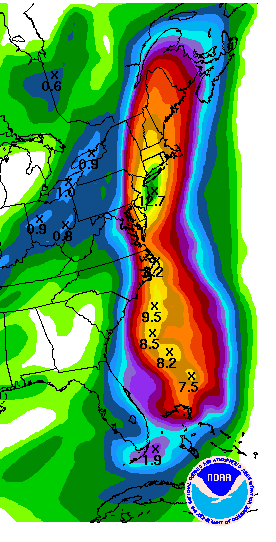 On top of that, a foot of rain is forecast to occur with Irene. This will make it even easier for winds to uproot trees. At this point, Irene looks similar to Hurricane Bob which was the last hurricane to hit mainland New England. We got a little lucky with Bob because the storm struck Long Island and Rhode Island at low tide. We might not be lucky with tide timing this time. Regardless, there were people along the Middle Atlantic coast and in New England without power for ten days to two weeks due to Bob. So, if you are in the outlined areas, be thinking -- now -- about how you are going to handle this storm. I have some suggestions here. And, unless the Secret Service can wrestle Hurricane Irene to the ground, I suspect President Obama will be cutting his vacation on Nantucket a little short.